Gibbs Hybrid offers flexible options to control resource demand, project requirements and delivery. Our clients have consistently reduced their total cost of ownership by partnering with us to determine live project requirements and successfully deliver the right outcome to the technology and change programmes at the right time. We specialise in delivering programmes in the £50k – £20m range where our ability to execute at speed with innovation allows our customers to realise benefits quickly. All our solutions are underpinned with our Gibbs Hybrid governance and end-to-end service wrap – a Statement of Work to specify and manage deliverables, PMO and MI teams to manage the cost and effort burn in addition to our Service Management team and Executive Sponsorship to ensure we continually improve and deliver value and end results. Our clients always have bright ideas for programmes or projects, but those that have the ideas may not necessarily be responsible for the “people” aspect or accountable for the deliverables; and often not even the people who have to run it or deliver it. Moreover, they are accountable for the overall programme. Our “as a Service” offerings further enable us to work with you to define a specialist and cost effective service and solution to achieve your required goals. Our ARM,RISER and FRMS framework delivers a flexible but controlled option for delivery of fixed project outcomes and deliverables, whilst simultaneously removing the headaches and issues that can be associated with workforce management. Whether you are looking to internalise your Scrum Team or have an on demand service to manage your Scrum Team meetings globally, Gibbs Hybrid can help. As organisations move to a more Agile way of working the need to deploy suitably skilled Scrum Teams becomes ever more important. Our collaboration with you will determine what your SCRUM requirements are and we will then provide a suitable SCRUM model to suit your needs. Gibbs Hybrid can provide extra capacity and expertise to carry out new ideas for delivery; our team will transfer their knowledge to your organisation. We give you the transparency of the teams’ performance such as Velocity and Burn down rates so you are always in control. We provide full service and account management to rapidly expedite any issues as or if they arise. Are you looking to switch from an incumbent supplier? Whether it’s for cost reduction, more effective delivery and/or process standardisation, Gibbs Hybrid Transition Services can help you. Our method emphasises everything you’d expect, plus extra value-add, additional analytical statistics, continuous improvement through trusted relationships, collaborative partnership approach, re-engineering and innovation and access to better talent and technology, carried out quickly and efficiently. We’ll manage all parts of the transition seamlessly, while mitigating risk and loss of business. Gibbs Hybrid were approached to assist one of our global Credit Card clients with the transition of resources from incumbent suppliers. Timelines were very tight and certain contractual clauses with the incumbents needed to be resolved. Diversity, inclusion and community engagement – the three keys to valuing all voices. Do you have a project that you need to deliver with tight deadlines, multi-disciplines and restrictive budgets? Allow Gibbs Hybrid to collaborate and partner with you to achieve your outcomes. With our unique Agile and project delivery methodology, we can partner with you to create a bespoke solution to achieve your project successes whilst utilising our skilled and talented Consultants, all underpinned by an end to end fully managed solution, including Service Management, MI, PMO & Finance Support. We spend time with you to ensure that we fully understand your culture & requirements and build a robust team and delivery engine to meet each and every objective. We cover varying types of programmes covering mid-level spend and budgets ranging from £50k to £20M. Whilst our technical coverage and expertise is vast, we are specialists with Programme Management, Business Analysis, Testing, Architecture, Marketing and Communications, Implementation, Data Centre Migrations and Change Management. We take pride in our partnership with our clients and work especially hard to ensure we never put those relationships at risk and expertly execute whilst adding value throughout each engagement. Unsupported infrastructure & applications and controls issues - global cards & banking business. Gibbs Hybrid Anti-Money Laundering (AML) and Know Your Customer (KYC) programme teams, based in Luxembourg, London and Dublin, support major financial institutions across the globe. Our KYC/AML practice helps financial institutions to reduce risk more effectively, improve their ability to meet regulatory commitments, and enable an efficient KYC process resolution on client accounts, helping them to reconvene core business activities and operations. Gibbs Hybrid offers clients a range of end-to-end, interchangeable, Know Your Customer services that can be tailored to suit specific business needs. Whether it’s full-scale account migration with complete end-to end process design and management or just individual services to complement an organisation’s mature AML Programme, we have the financial market and regulatory experience to make the difference. Our experience spans private banking, wealth management and fund-specific operations, ensuring that the relevant and appropriate level of due diligence is performed according to the high standards of the Industry. Covering the full suite of regulatory steps such as origin of the funds, wealth factor, ultimate beneficiary (UBO) dilution processes, complex entity analysis (Alternative funds, Partnerships, Unit Trusts, SPVs…), we correctly analyse the risk assessment category with maximum precision to capture all the potential risk elements. Read our latest case study about how we helped a custodian and investment services bank to remediate their anti-money laundering (KYC) entity files for its investment fund clients (made up of mainly UCITS & AIFs which include SPVs, Trusts and Complex entity Structures) to meet a regulatory deadline set by the CSSF. 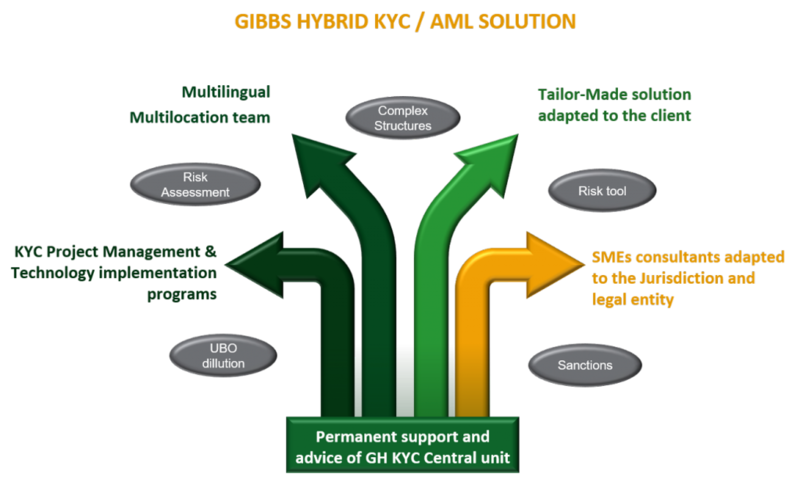 The Gibbs Hybrid KYC Solution helps our clients define and optimise processes and tools whilst providing highly trained, accredited and multilingual teams, based full-time in Luxembourg with operations in Dublin and London. We have an additional centre in Gdansk, Poland, which is the hub for our market intelligence and outsourcing units. Our financial services expertise is augmented by our Project Management as a Service (PMaaS) capability. This combination is seamless and unique, giving clients the option of end-to-end comprehensive solutions through a single source. Gibbs Hybrid has a specific high calibre unit (Assessment & Advisory) to support our clients’ internal departments with sensitive and high-risk phases. We provide analysis of wider AML risks across in the portfolio or a redefinition of the Risk Matrix Calculation. We are also working with several institutions on their strategy to manage the uncertainty around Brexit. While the UK has a policy of implementing EU regulations to the fullest – GDPR is a recent example – the deeper complexities lie in potential disruption to EU/UK trade agreements, taxation and the issues around the free flow of workers between countries. From an AML/CTF/KYC perspective, our team can manage the subsequent migration of current UK records to new jurisdictions in, for example, Dublin or Luxembourg. 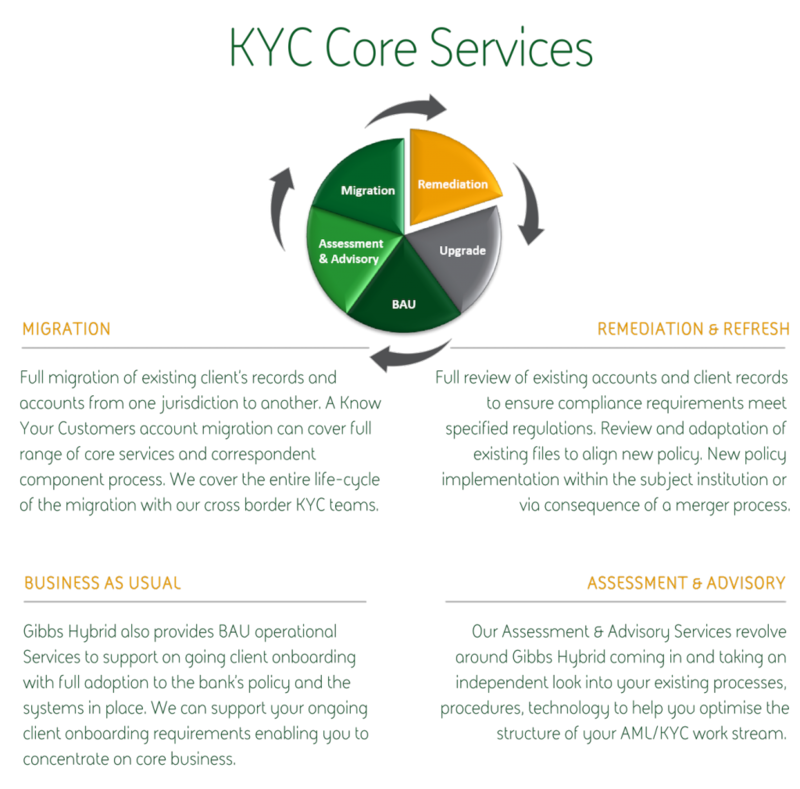 Contact us to discuss how we can support your organisation through a broad range of KYC projects. Optimising a blend of both permanent and contingent talent enables organisations to be agile, responsive and relevant with the latest skills and expertise in an ever changing market. We have the expertise, background and infrastructure to deliver a full end-to-end solution. We have served some of the worlds largest corporations and taken on the administrative burden freeing up our customers time, allowing them to focus on their priorities.